This is a really enjoyable book, well researched and nicely written. The subject matter is of relatively narrow scope so McCullough’s focus is primarily on the characters, personalities and relationships of his major subjects. Wilber the elder and Orville the younger, are totally fascinating in their dedication to honesty, integrity, their dream and their family. But the story is also that of their younger sister Katharine and their widowed father, Bishop Milton Wright. 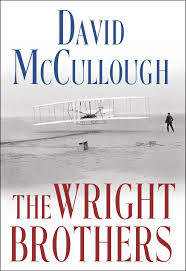 I knew Wilber and Orville were bicycle mechanics and that they invented a working airplane which they flew at Kitty Hawk, NC. End of prior knowledge. What I didn’t know was how determined, hard-working and humble they were. I didn’t know they were scoffed at and disbelieved and had a seriously difficult time getting recognition on any level. Then, after demonstrating what they could do time and and again, I had no idea of the fame and glory they received, how miraculous it seemed to Americans and Europeans of the early 20th century. McCullough is perfect on setting the scene, boomer America, where science was conquering nature and peace and prosperity reigned. This is the same setting Eric Larsson has going for him and describes so well in Isaac’s Storm – about a hurricane which surprised the scientists. So, too, the Wright Bothers surprised common and scientific thinking but the results were devastating like the Galveston Hurricane of 1900. The source material most often used is straight from the Smithsonian’s archives, letters and notes etc either from the hands of Wilbur, Orville, Katharine or the Bishop, or to them. The photographs are great. The reason for the lower score is that I think I’m getting more demanding of non-fiction and although McCullough makes for enjoyable reading, there’s something about it which feels like it’s young adult material – it’s good now, but I would have loved it at age 16.